Four links to reading passages (I have included open ended questions) about 1790s USA. 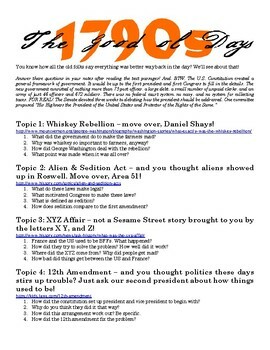 Topics are: Whiskey Rebellion, Alien & Sedition Act, XYZ Affair, 12th Amendment. The Good ol' days weren't quite as good as the textbooks might have led us to believe! BTW. the script font at the top is Thomas Jefferson's own handwriting in font form.